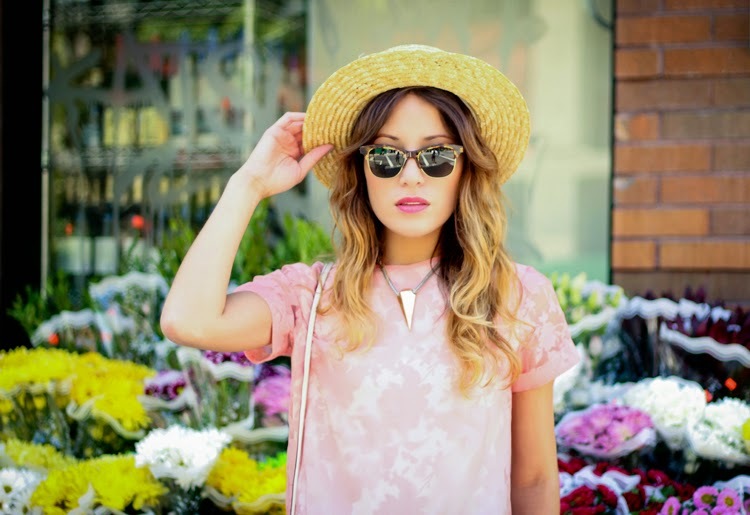 Dorothy Perkins Pink Burnout Tee, American Apparel cutoff shorts (similar here), Nasty Gal boater hat (similar here), Oliver People's West Hobson sunglasses, Forever 21 spike choker, Sophie crossbody bag c/o MZ Wallace, 80%20 suede brogues (also seen here). Shot by Isaac Lacey. When it comes to my style, I probably border more on tomboy than feminine, but that doesn't mean that I don't like girly things altogether. Delicate lingerie, fresh flowers, pretty patterns, luxurious bubble baths and sky-high heels are just a few of the super-femme things that I like to indulge in once in awhile. So when Dorothy Perkins asked me to style some limited-edition pieces from their new All About Rose collection, I said yes without any hesitation. I loved the collection's fun textures and girly prints, and couldn't wait to give them my own little spin with edgy denim and funky accessories. The resulting shots wind up reading a little bit like a day in my life, starting with a cup of coffee on my balcony in the morning, followed by an errand run in the neighborhood and finally ending with a bike ride with my man. 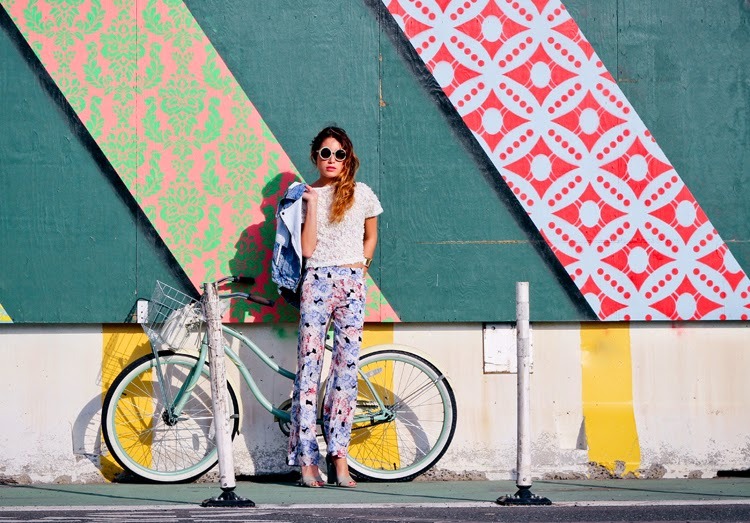 Looking for more inspo on how to wear these fresh prints and separates? You can check out additional pics here alongside more looks put together by two of my blogging faves Erica Lavelanet & Carina Hsieh. We all have such different styles so it's fun to see how we all rock them. Look 2: Dorothy Perkins rose crop top and printed trousers, Warehouse denim vest (similar here), Big Freedia sunglasses c/o Chilli beans, Vince Camuto heeled sandals. Look 3: Dorothy Perkins pink button-back top, Kitti sunglasses c/o Quay Eyewear, Tracy Reese eyelet skirt (similar here). love all these looks! u look so pretty! 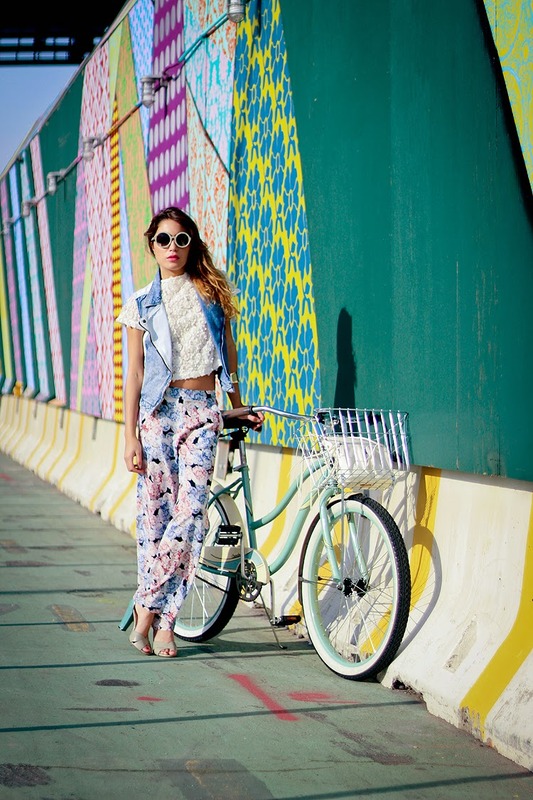 love all of the floral! you are just beautiful, lady!